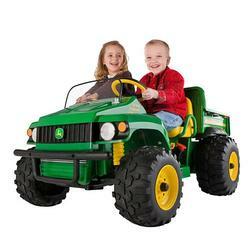 This ride-on vehicle lives for rough terrain with its big-tread tires that offer excellent traction. Kid-friendly styling includes a charming grille and wide, impressive-looking tires. Thanks to the attached dumping cargo bed with operating tailgate, kids can actually contribute to lawn maintenance by clearing the yard of debris before other family members mow it.